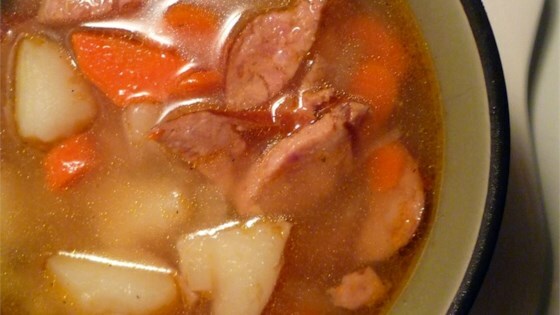 "New potatoes are simmered with onion, celery, carrots and kielbasa in this simple soup." In a large pot over medium heat, combine potatoes, onion, celery, carrots and sausage. Cover with water. Bring to a boil, then reduce heat and simmer 1 hour. Hearty, flavorful soup with Italian sausage, vegetables, and pasta. Pretty Good. Easy recipe that you can play with a bit. I would use a little less kielbasa, the soup had a bit more fat in it then I wanted.